The Texas Stars showed no signs of rust after their one week layoff from playoff hockey, taking game one of their division final series with Chicago in dramatic fashion. The overtime win was the first in Texas Stars history and also the first playoff overtime game for the franchise. Texas started the scoring in the first period and never trailed in the game. Colton Sceviour potted his first of the playoffs just 6:34 into the first period. Sceviour took advantage of a bounce of the puck off of the Wolves' Greg Stewart and backhanded it past Mannino for the 1-0 lead. The lead didn't last long as Chicago's Jason Krog redirected Arturs Kulda's "shotpass" between the pads of Brent Krahn to tie it at 1 just 53 seconds later. Overall the first period was high in shots with 13 a piece but each tender only allowing one past. Again in the second, Texas opened the scoring. Francis Wathier tipped a Maxime Fortunus bomb from the point for his first of the playoffs. The goal came on a delayed penalty call on the Wolves. Chicago answered back on the power play when Anthony Stewart's redirection beat Krahn for the 2 all tie. Texas and Chicago tied on shots in the 2nd period as well at 9 for a total of 22 for each team through two periods. Before we knew it in the third, it was Jamie Benn striking again. Benn scored his fourth of the playoffs on garbage collection from a Dan Jancevski shot. With 19:44 left in the period, Texas had to defend a 1 goal lead. It was close, but it couldn't be done. Chicago tied it up off a faceoff in the Stars zone. The puck bounced off a Stars defender's skate and landed on the stick of Joey Crabb, who found twine behind Brent Krahn for the 3-3 tie. Dan Jancevski would take a high-sticking penalty with 1:42 left in the game, leaving Texas short-handed trying to fight for overtime. A solid PK took the game to the extra period. The Wolves had some malfeasance of their own as Jason Krog, their leading scorer against the Stars, took a high-sticking call 66 seconds into the OT period. With Texas on the power play, Garrett Stafford accepted a pass from Jamie Benn and scorched one from the high slot to the back of the net. Brent Krahn was fantastic, especially in the third. He took 13 shots and made 12 saves in the period. Overall, he faced 35 shots and stopped 32. Peter Mannino had 24 saves on 28 shots at the other end of the rink. Krahn did have to make some solid saves for the Stars to keep them in the game. However, I think the Stars defense has come to play in this series. Despite the high number of shots, I don't think the quality was as high as the Wolves would like. Certainly a step above the quality of the IceHogs' shots, but not quite at the top of the Wolves' game. Next game is a matinee on Sunday afternoon. With Texas's win tonight, they have taken away the Wolves' home-ice advantage. Yes, Texas and Chicago may both have 3 home games but Chicago has to win in Texas now to get their 4th and win the series. Tonight's attendance was 3,576. I thought hockey was big in the north? After a week off, your Texas Stars get back into the playoff hunt tonight in Illinois again. Texas's second round matchup is against the Chicago Wolves, the regular season winners of the West Division with 105 points on the season. At one point in time, they were out of the playoffs. This blogger even made the comment that San Antonio needed to watch their back because Chicago was nipping at their heels. Looks like I was right and Chicago surged to the front of the pack. The Wolves started out their season slow with a 3-6-0-1 record. In that 11th game, they turned it on and haven't looked back since. The Wolves bounded over everyone in the division to finish 6 points ahead of Texas, who led the division for much of the season. The regular season between the two teams was relatively evenly matched, despite what sticks in the fan's minds. Texas was a decent 4-3-1 against the Wolves this year, but 3-1-0-0 at Chicago and 1-2-1-0 at Texas. The Cedar Park Center did not see the Stars play their best hockey against the Wolves; the Allstate Arena did. That's a great thing since the Stars must steal a game from the Wolves in Rosemont to win the series. This matchup is an interesting one because of the styles of play. Texas plays a defensive game that focuses on an opportunistic offense. Chicago plays a real skill game. That's not to say that Chicago is a slouch on defense though, and their tender is one of the best in the league. On paper, it looks like a tough matchup because of the offensive power of the Wolves. But then you look at the Canadiens/Capitals series that just concluded. A team with solid defense and a hot goaltender completely melted the Capitals offense. The Stars are not the same underdog that the Canadiens were in that series, but I think that some of the same rules apply: get ahead early and protect the lead once you get it. Texas has yet to allow a goal in the first or second period this playoffs and that's a recipe for success. The Stars were 35-5-1-1 when scoring first in the regular season and were a similar 35-1-1-0 when leading after the second. Meanwhile, we have documented well the Stars dismal efforts to come back after trailing in the second intermission. Texas held one of the worst records in the league when trailing after two: 1-21-1-1. The Wolves went 7-19-0-5 in the same situation. All year, Texas's best period was the second, outscoring opponents 86-64. A solid defensive game allowed them to take advantage of bad changes and the long change in the middle frame. This has continued into the playoffs with scoring at 7-0. The good news for the Stars is that the Wolves record in the second is not so good at 5-10. The middle frame is the one to pounce on. The goalie matchup in this series is a great one. Brent Krahn, who played for the Wolves last year, has a 3-1-0-0 record against his former team. His 1.25 GAA and .961 SV% lead all tenders in the playoffs. On the Wolves side, Peter Mannino is the man at the end of the ice. He started all seven games in their series against the Milwaukee Admirals, but did not finish all of them. Backup Drew MacIntyre took over in relief in two of those games. Mannino has a 2.89 GAA and .901 SV% in the playoffs for a 4-2 record. He played in 6 of the games against the Stars this season, accumulating only a 2-1-1 record with a 2.39 GAA and .909 SV%. Think goaltending might be a big deal in this one? I do. On the offensive side, Texas's leading Wolf hunters were a little different than they were against the IceHogs. Aaron Gagnon leads all scorers with 9 points (1-8-9). Four players were tied at 6 points against the Wolves after Gagnon: Wathier (4-2-6 in 6 GP), Peters (3-3-6 in 7 GP), Rallo (2-4-6 in 6 GP), and Sceviour (1-5-6 in 8 GP). Francis Wathier is your goal scoring leader with 4, followed by Peters and Morin tied at 3. Travis Morin, who leads the Stars in assists in the playoffs with 7, has yet to tally a goal. If we add to this offense, the potential of Jamie Benn, who has never faced the Wolves but scored 3 goals and 3 assists against the IceHogs, then the Stars have a potent offense in their first line of Benn-Gagnon-Rallo. Against the Stars, the Wolves are led up front by savvy AHL veteran Jason Krog. Krog was 3-8-11 in 7 GP against the Stars this year. Brett Sterling and Anthony Stewart are tied for the goal scoring lead and tied in second for points both with 4-3-7. GM Scott White joined the boys on The Bottom Line this afternoon. Lots of good hockey talk today. It was a great week in Austin for hockey lovers. The Texas Stars took a long respite from playing until Wednesday when they reignited their series with the Rockford IceHogs (Chicago Blackhawks) in Rockford. Texas managed to win both Game 3 on Wednesday and Game 4 on Friday to sweep the series. It was the first playoff series win in franchise history. Now, the waiting has begun. The same night that the Texas Stars locked up their berth in the second round, the Milwaukee Admirals (Nashville Predators) rallied back from a 3-0 deficit to beat the Chicago Wolves (Atlanta Thrashers) in overtime and force a Game 7 in that series. Chicago closed out the series with a 2-1 win on Monday night and will face the Stars in Chicago starting Friday. Below the fold here, we'll take a look at the Stars 3rd and 4th playoff games and break down the matchup versus Chicago. HDH: Tell us about the Allen Americans season overall. DSLITR: You never really know what to expect with a first year expansion team, so to do what the Americans have done is very impressive. The Americans finished the regular season with a 42-17-5 record, which was good for 89 points and the 2nd best record in the Southern Conference. The 89 points that Allen posted was the 2nd most for a first year franchise, trailing only the Colorado Eagles who tallied 91 points during their inaugural season. Even more impressive was the Americans 23-5-4 record at the Allen Event Center. That home dominance has continued into the postseason, as the Americans have gone 5-2 at the AEC so far. The postseason has seen the Americans compete in 2 series, both of which went to Game 7s. The Americans ousted the #3 seeded Laredo Bucks in the Conference Semi-Finals and most recently defeated the top seeded Odessa Jackalopes in the Southern Conference Finals. Allen is now taking on the Northern Conference’s top seeded team in the President’s Cup Finals, the Rapid City Rush. The Americans also had 2 players nominated for major CHL awards this year. Goalie Chris Whitley was nominated for Rookie of the Year and Most Outstanding Goaltender, while forward Bruce Graham was nominated for Most Valuable Player. Neither player won, but their on-ice contributions were definitely not overlooked. HDH: Can you tell us a little bit about the teams in the CHL, that is, where are they located and what is the league's format, etc? Anything that might be different for AHL or NHL fans. DSLITR: The CHL consists of 15 teams divided into 2 conferences. The Northern Conference features the Rapid City Rush, Colorado Eagles, Bossier-Shreveport Mudbugs, Mississippi RiverKings, Missouri Mavericks, Tulsa Oilers and Wichita Thunder. The Southern Conference features the Odessa Jackalopes, Allen Americans, Laredo Bucks, Texas Brahmas, Corpus Christi Icerays, Rio Grande Valley Killer Bees, Arizona Sundogs and Amarillo Gorillas. As you can probably tell, the majority of the teams are located in the Southern United States (Texas has 7). The CHL’s season consists of 64 regular season games and a 4 round postseason. The top 5 teams in each conference quality for the playoffs and earn the chance to compete for the Ray Miron President’s Cup. The opening round of the playoffs features the 4th and 5th seeded teams playing each other in a best-of-3 series. The Conference Semi-Finals, Conference Finals and President’s Cup Finals are all played using the standard best-of-7 format. The rules in the CHL are pretty similar to those seen in the NHL or AHL. A first time CHL viewer might notice that the league uses a no-touch icing system, which is probably the only noticeable rule difference between the leagues. HDH: How has fan participation and attendance been in Allen this first season? DSLITR: Fan participation and attendance have been pretty good for Allen this year. Weekend games drew pretty nice crowds all year, and we even had a few sell-outs. It seemed like the crowds got bigger and bigger each game, which really showed just how good of a product the organization was putting out on the ice. Playoff attendance started off a little slow but really picked up during the Conference Finals series versus Odessa. As far as fan participation, the Allen Event Center can get very loud. The fans have been great all season long and have really gotten behind this team. It seems like there is always some kind of a chant going on during the games. The organization does a great job of keeping the fans entertained during the breaks and intermissions as well. It’s definitely a really neat atmosphere in there. HDH: Who are the key players on the team? Have any gotten extended callups? DSLITR: The big 3 on the Americans are Bruce Graham, Justin Bowers and Nino Musitelli. All 3 had great regular seasons, but they have been downright dominant playing on a line together so far in the postseason. Bowers currently leads all playoff skaters in points while Musitelli is ranked 4th and Graham 5th. Their play is probably the biggest reason why the Americans find themselves in the President’s Cup Finals right now. You also can’t forget about goaltender Chris Whitley, who led all CHL goalies in regular season wins (31) and has been just as good in the playoffs. There weren’t any extended callups for the Americans during the season, but both Chris Whitley (Texas Stars, Lake Erie Monsters) and Justin Bowers (Abbotsford Heat) saw brief action in the AHL. HDH: Stars fans would be interested to see Jordie Benn on the roster for the Americans. What has his role and impact been on the ice this year? DSLITR: Jordie is an exciting player for the Americans. He is more of an offensive defenseman, but is very strong and responsible on the defensive side of the ice as well. Jordie quarterbacks the 2nd powerplay unit for the Americans and is not afraid to join the rush whenever the opportunity presents itself. He has a great shot and is very good at moving the puck. Jordie tallied 9 goals during the regular season (18 total points) and has added 2 more so far in the postseason. I can definitely see him jumping up to the AHL level next season. HDH: How has the netminding been for the Americans? I know there was a trade in the middle of the season that affected the team between the pipes. What has been happening in net? DSLITR: Netminding has been very solid for the Americans throughout the season. They started the year off with the duo of Charlie Effinger and Chris Whitley between the pipes. Both goalies had strong starts and split playing time for the most part. As the season progressed, Whitley emerged as the starter which really started to limit Charlie Effinger's playing time. Effinger wanted to start and the Americans wanted Effinger to be able to play, but unfortunately there was not enough room with Chris Whitley playing so well. The Americans decided to give Effinger a chance to start elsewhere and traded him to the Missouri Mavericks at the trade deadline. Chris Whitley showed the Americans that they made the right decision by keeping him as the starter, finishing the regular season with an outstanding 31-8-1 record and a 2.60 GAA. Whitley has been just as good in the playoffs, including stopping 48 of 49 shots during Game 1 of the President's Cup Finals. HDH: What is the makeup of this team? For example, the Texas Stars are a defensive team that has opportunistic offense. What about the Americans? DSLITR: The Americans are a defensive team but can also be very explosive offensively. They allowed the fewest amount of goals (183) in the Southern Conference during the regular season but also scored the 4th most (210). Their diverse style of play is really what makes them so tough to beat. If you want to play a run and gun style of game the Americans can do that or if you want to play a low scoring 2-1, 1-0 game the Americans can do that as well. Once the Americans have the lead they are almost impossible to beat, going an incredible 25-1 during the regular season when leading after 2 periods of play. That stat kind of reminds you of the old Dallas Stars teams from the late 90's and early 2000's. HDH: Predictions for this series? DSLITR: I think that this will be another tough series for the Americans, but I really do like their chances in taking it. Rapid City is a talented team and was the Northern Conference's top team throughout the season, but I just don't think that they can match the Americans play. The Americans got the series off to a great start by taking Game 1 (4-1), so things are definitely looking good right now. I'd like to see the series end on home ice in Game 4 of 5, but I'm going to have to go with the Americans in 6. HDH: Why should Dallas Stars fans come out to the AEC for this series? DSLITR: When you come out to the AEC, you're not only going to see some great hockey, but you're are also going to have a great experience. The AEC has only one seating bowl, so you really feel like you're right on top of the action no matter where you sit. There's not a bad seat in the house, and tickets start as low as $9 most nights. The atmosphere is always great, and I really think that it's neat to be part of a small, local team that not everyone knows about. The Americans organization has put together a very good product on and off the ice, and the game presentation is always top notch. It's really a great place to bring the whole family, and now is the perfect time to make your first time out to Allen, with Games 3, 4 and 5 of the President's Cup Finals being played there starting on Wednesday. Game 1 – Fri., April 30 – Texas at Chicago, 7:30 p.m.
Game 2 - Sun., May 2 – Texas at Chicago, 3:00 p.m.
Game 3 - Tue., May 4 – Chicago at Texas, 7:30 p.m.
Game 4 – Wed., May 5 - Chicago at Texas, 7:30 p.m.
Four games down in the march to the Calder Cup for the Texas Stars. Tonight's win marked the first playoff series win for the franchise and advances them to the next round against either Chicago or Milwaukee. The Wolves and Admirals will play a Game 7 in Chicago on Monday night to decide who moves on. Let's get down to the play-by-play. Texas opened the scoring in the game on the power play off the stick of Andrew Hutchinson. Just four minutes into the game with Rob Klinkhammer in the box for interference, Hutchinson's point shot made it past goalie Corey Crawford to put the Stars up 1-0. Assists on the play came from Travis Morin and captain Landon Wilson. Brent Krahn's strong play kept it at 1-0 as the IceHogs put a barrage of shots on net following the Gagnon high sticking minor in the second period. A number of "how did he do that" saves preserved the lead. Texas would extend the lead to 2-0 on a nifty play by a hybrid line. Jamie Benn and Perttu Lindgren skated in with the puck, Lindgren passed to Benn who immediately passed across the ice to the trailer, Beaudoin, who had an empty net. For Beaudoin, it was his second goal in as many games. Less than two minutes later, Texas would mount a 3-0 lead again off the stick of Hutchinson. Hutchinson whacked the puck from the high slot like it said something about his momma and beat Crawford in the top left corner of the net. Lindgren and Morin assisted on the power play tally. Rockford was not defeated yet. After putting 28 shots on net through the first two periods, the IceHogs laid 12 more on Krahn in the final period and not all of them were stopped. Both tallies came on the power play. First, eight minutes in, Kyle Beach scored on the power play to make it 3-1. Then, late in the game, Texas got into penalty trouble. Trevor Ludwig took a delay of game penalty for closing his hand on the puck in the crease with 3:20 left in the game. Fifty-one second later, Francis Wathier took a tripping call. Texas faced a 6-on-3 for many seconds and then a 6-on-4, finally succumbing and allowing a 2nd goal in a playoff game for the first time in Stars history. It was Kyle Beach again. Luckily, Texas had enough gas in the tank to close it out and tally an empty-netter by Warren Peters. What a game (and series) from Brent Krahn, who certainly earned his #1 star. He stopped 38 of 40 shots on net in the game and his GAA for the series went up as he let in 2 goal tonight. Wow. I won't eulogize the IceHogs, that's for someone else to do on their blog. However, I will say that they have now lost 10 straight playoff games dating back to May of 2008. Coach Peters has a good team in the regular season, but doesn't have the right formula for post-season success. The IceHogs will now have the long summer to think it over. For Texas, it is either Chicago or Milwaukee. We won't know until Monday night which one it is. Texas now gets some well-deserved rest before starting the division finals. Tonight's attendance was 2,403. That's just sad. Could the Stars break out the brooms tonight and win their first ever playoff series in a sweep? It's possible. After an offensive thumping of six goals spearheaded by Jamie Benn (2-2-4), Rockford precariously on the edge of the end of their season. It's worth noting that every team with a 3-0 series lead in the NHL since the lockout has won the series. Last gameday preview, I mentioned that through two games IceHogs goalie Corey Crawford was doing well (5 goals against). Wednesday's game did not go as well; Crawford was pulled after allowing 5 goals on 21 shots in two periods. Backup Hannu Toivonen started the third in relief and allowed one goal on the first of five shots in the period. Crawford still gets the start. Brent Krahn has been a brick wall in net for Texas so far in the series. With a 1.00 GAA and a .966 SV%, he leads the AHL in both categories for the playoffs. It would have been nice to get him the shutout last game, but the truth of the matter is that the W is more important than the blank sheet. Krahn has said as much. For Texas, Jamie Benn and Travis Morin top the rookie points charts with 5 each. Benn has 3 goals and 2 assists while Morin's points have all been helpers. Overall, all but 4 skaters have points in the series (Korostin, Tr. Ludwig, McCulloch, and Stephenson). For Rockford, Rob Klinkhammer leads, a word I use loosely, with a goal and an assist in the series. The compete level of the Rockford offense was anemic at best on Wednesday night. They squandered a 5-on-3 early and never really recovered to mount any meaningful challenge. After the fighting and scrumming after the whistle in the first two games, Rockford seemed to think they were playing in a beer league game that didn't allow contact on Wednesday. The intensity just wasn't there, and it showed on the scoreboard. So, could it be the first 'handshake night' in Texas Stars history? I think there's a pretty good chance, but then again, there's a reason why they play the games. If you were able to watch or listen to tonight's game, consider yourself lucky. This was likely one of the most complete games the Texas Stars have ever put together. The Stars matched their record for goals for at 6 and smothered Rockford's offense, allowing only 1 goal in the game and not until the third period. Texas has still never trailed in the series. With a 3-0 series lead, the Stars hope to close out the series on Friday and wait for the winner of the Chicago/Milwaukee series to be decided. The first period was mostly quiet with both teams getting their chances until a power play at the end of the period. Just 4 seconds into the man advantage and with only 25 seconds left in the period, Jamie Benn won a faceoff back to Andrew HUtchinson at the left point who snapped it over to Garrett Stafford. Stafford buried the shot stick-side high on Crawford. Just 86 seconds into the second, Texas did it again. Jamie Benn skated in on the left wing side and used the Rockford defenseman as a screen to beat Crawford low on the stick-side. Just a few minutes later, Texas successfully defended a 5-on-3 opportunity for the IceHogs, and any energy that Rockford and the MetroCentre had was gone. The last best chance in the period for Rockford was a two-on-one that Brent Krahn got over for and took the puck to the chest. Texas scored three more times in the second period, first off the stick of Landon Wilson. A one timer from the captain on the pass from Travis Morin put the Stars up 3-0. The assist for Morin was his 4th point of the series. Greg Rallo scored on the power play exactly 3 minutes later on a weird rebound play off a faceoff that beat Crawford five hole. Benn and Gagnon assisted on the tally. Finally to round out the period, Jamie Benn did it again. His 2nd goal of the evening and 4th point of the night came when he collected his own rebound, pulled it away from Crawford and roofed it over the prone goalie. Crawford looked like a man defeated. Hannu Toivonen came out to start the third period. Texas would surrender one goal in the third, a goal by rookie Ben Smith. The Stars would add another by Mathieu Beaudoin in the period to bring the score to 6-1. Perttu Lindgren gets a lot of credit for Beaudoin's tally, as he skated all the way down behind the Rockford net and passed it through traffic to the waiting stick of Beaudoin in the slot for the one-timer. Travis Morin got the 2nd assist for his 5th point of the series. Jamie Benn had a night and got the first star honors with 2 goals and 2 assists. He now leads all Stars scorers in points. Brent Krahn continues his solid play and keeps his goals against average at 1.00, a great number any time of the year. Texas could close out the series on Friday and sweep their first playoff series ever. Here's hoping Friday is handshake night. Mathieu Beaudoin returned to the lineup after being out since March 18th. He scored a goal in his return this evening. Josh Fisher joined "The Bottom Line" hosts for the "On The Ice" report today. Jason Cullimore looks to be joining the IceHogs tonight coming off an injury. After a long delay, Texas and Rockford resume their best of seven series tonight with a game in Rockford, IL. So far, Texas has emerged victorious from the first two games in the series, both on their home ice. The Stars have played in Rockford four times so far this season and have not lost yet. It is certainly a confidence booster for the guys to know that they can win in the building, but the playoffs are a different animal, so we can't guarantee anything. For Texas, as it's been all year, the story is opportunistic offense and solid defense. Goaltender Brent Krahn and the Stars blue-liners have only allowed one goal in each game, both in the third period. In fact, Texas has never trailed in the series. Krahn leads all goaltenders in the playoffs in GAA (1.00) and SV% (.967). Goaltender Corey Crawford for the IceHogs has done decently well with only five goals against in the series but has not gotten the offensive support he needs to win games. On the offensive side, #1 Stars killer, Kyle Greentree, will return to the series tonight after sitting out game 2 with a suspension for his actions in Game 1. Kyle Beach and Rob Klinkhammer are tied in the series with one goal each. On the Stars side, Travis Morin leads all scorers with 3 points, all assists. Ray Sawada has the goal-scoring lead so far with 2 and Colton Sceviour also has two points, both assists. Several other Stars have 1 point. Interesting to note that Ray Sawada has two goals in two games and also a 100% shooting percentage. Two shots, two goals. The Texas Stars are two games into the franchise's first ever playoff series. They've shutdown the Rockford IceHogs (Chicago Blackhawks) at home thanks to strong performances from Jamie Benn on Friday and Brent Krahn on Friday and Saturday. As you've all been seeing the short updates that I've been posting here as the games complete, I won't need to go into too much detail on the games. Texas now takes the series on the road for the team's first ever away playoff game. The Stars have yet to allow a goal in the first or second period in the playoffs and have not given up more than one in either game, winning 2-1 and 3-1 on Friday and Saturday respectively. Brent Krahn has had a sparkling performance so far despite these two games being only his 2nd and 3rd AHL playoff starts ever. His previous lone start came with the Omaha Ak-Sar-Ben Knights. For the record, Ak-Sar-Ben is Nebraska backwards, and it's sort of a thing in Omaha. Below the fold here, we'll take a second look at the games from this week and preview next week's. Also, there's been an update on the Texas Stars franchise status and possible future in Austin that we'll discuss. Finally, we'll finish up with a look ahead to this week's Games 3, 4 and maybe 5, with the IceHogs in Rockford. Contentious at times but victorious in the end, Texas battled Rockford to hold serve and win both of their home games in their West Division playoff series. Texas opened in the scoring in the first period. A battle in front of Rockford netminder Corey Crawford by Travis Morin and Colton Sceviour bounced the puck out to Maxime Fortunus who slapped it in from the top of the right wing circle. It was Fortunus's 1st of the playoffs. Only five minutes later, Perttu Lindgren notched his first of the playoffs as well. Colton Sceviour was in on the play again, making the initial shot that bounced off Crawford's pads to Perttu Lindgren. "Great play by [Colton Sceviour]," said Lindgren after the game. "It was almost empty net." The Stars outshot the IceHogs in the first and overall on the night, a rarity for this team. In the second period, Rockford outshot the Stars and Brent Krahn shined bright again. Krahn had a glorious skate save at around the 7 minute mark of the second on a slow dribbler that would have gone in. Texas locked down the traffic in front and Krahn did his part to stop the outside shots. "Guys did a good job of tying up sticks," remarked Krahn. "I can see the shot, so my guys are doing a great job of sealing out." Ray Sawada scored his 2nd of the playoffs in as many games to start the third period. Some fancy passing at the blueline by Sawada got the puck over to Warren Peters on the left side. Peters skated down the left side and got it back to Sawada who ticked one off Crawford's glove and into the net. Crawford was not happy with himself after that play. With the score at 3-0, all sorts of unpleasantness ensued in the last 7 minutes of the game. Scott McCulloch and Danny Richmond dropped gloves in the Rockford zone, and a scrum behind the Texas net led to misconduct penalties to Ray Sawada and Danny Bois. Peters, who was also involved in the scrum behind the net, commented that there were "certain incidents there where we felt we needed to respond." With five minutes to go, Brent Krahn lost the shutout bid. A hard kick off the end boards on a shot by Connelly ended up on the stick of Kyle Beach behind the goal line. His shot banked in off Krahn, who was facing the shot but not expecting it. Regarding the loss of the shutout bid, "We could have won 9-8," Krahn said, "and I would have been just as happy." So now the series moves to Illinois with Texas leading 2-0. Coach Gulutzan knows that winning two here in Austin was huge for the team. "It's hard to win back to back against the same team," said Gulutzan. "It was nice to get those two." And regarding the significance of the 4-0 record that Texas has in Rockford: "It means our players know they can win in that building but in the playoffs you have to work to win. It's not nothing." Sergei Korostin played tonight after dressing last night but not taking a shift. Last night's game was a great note to start on for the franchise. It was a win that spoke to all of the things we know about Texas Stars hockey: strong defense, solid goaltending, and opportunistic offense. Can the Stars repeat this performance tonight against the IceHogs? While the Stars did emerge victorious, the IceHogs weren't far behind. The final score was only 2-1. Corey Crawford is a pretty good goalie, but has simply not had luck against the Stars this year. His overall record this season is now 1-4-0 against Texas. Krahn was off the ice first in morning skate and will get the start tonight. One item that I did not mention in my Game 1 preview was the differences these teams have in power play and penalty kill percentages. Texas ranked #9 on the power play in the regular season at 19.1% and #2 on the penalty kill at 86.4%. Rockford was decent on the penalty kill at #10 with 83.3% but anemic on the power play at #24 with 15.2%. Their road PP percentage was even worse at 13.4%. Greg Rallo and all of the penalty killers take their role on the team very seriously. "I know a lot of guys, myself included, take a lot of pride in penalty killing," Rallo said. "If you can shutdown a team's power play, a lot of times that will feed some momentum your way. If we can shut down them down 90% of the time, most games you're going to come out on top." I don't think the impact that Jamie Benn had on last night's game can be overstated. Benn scored one, was on the ice for both Texas goals, had numerous opportunities, and was a thorn in the side of the Hogs all night. Benn's line with Rallo and Gagnon was dynamic on offense and really gives the IceHogs a different look. All three players can take faceoffs, Benn on the left and Gagnon and Rallo on the right. Kyle Greentree, one of Rockford's leading scorers against the Stars, will be out of the game tonight. He has been suspended for his cross-check on Warren Peters at the end of the third last night. There is some speculation that Ben Smith, who I mentioned in yesterday's game preview, will replace him. Commenting on all the scrums that were in the game, Landon Wilson said, "It's about the bigger picture. We can't get caught up in the scrums after whistles. I know they want to slow the game down a little bit with that and try to get under our skin, but we have to rise above that and be better than that." The Stars are calling again for a white out, so wear those free shirts from last night if you've got them. The give-away tonight will be rally towels. Just imagine the white out plus all the spinning rally towels. You've gotta love playoff hockey. The Stars captain, Landon Wilson, was the last one interviewed in the media day. He spoke to the team's veteran presence, his condition after his injuries this season, and whether he has any playoff rituals. Just after Aaron Gagnon came off the ice and before the media hoard got a hold of him, I had a chance to ask him about his experiences in Dallas playing in Mike Modano's (possibly) last game in Texas and what he feels like has been the driver of his second half surge to the team points lead. So I decided to start a Facebook fan page, considering how many Stars fans there are out there who use it. Join up by visiting Hundred Degree Hockey on Facebook. After a week of patient (and sometimes impatient) waiting, here we are. Central Texas is ready for its first ever taste of AHL Playoff hockey. The Rockford IceHogs come to town to open up the Calder Cup playoffs for the Stars. Tonight's game will be the first playoff game in franchise history. Of course, just because it's the first game for the team doesn't mean it's the first playoff game for the players. Between the players on the Stars roster, Texas has 323 total games of AHL and NHL playoff experience. This is in comparison to Rockford's 165 total games. It feels really difficult to write a playoff preview against Rockford because I feel like the Stars have not had a dialog with the team. Texas and Rockford played 5 times in a 30 day span starting in November and didn't meet again until March. There was no back and forth over the course of the season. In all, the Stars won six of the eight matchups. Realistically, the Stars weren't really even in it to win it on the eighth and final matchup last week, so perhaps we'll toss that one out. Still, despite eight games against, the IceHogs feel like something of an unknown quantity, as opposed to Peoria, Chicago, or the other Texas teams. Top players for Texas in the season series include Travis Morin, who clocked in with 1 goal and 9 assists; Mathieu Beaudoin, currently injured, with 3 goals and 4 assists; and Warren Peters, the leading goal scorer, with 4 goals and 2 assists. Also of note is Landon Wilson, who played two games against the IceHogs this season and scored twice. Of course, the big story on the offensive front is Jamie Benn. Benn joins the club after spending a full 82 games in Dallas this season. He scored 22 goals and tallied 19 assists in his rookie season in the NHL. This sort of player movement is not without precedent in hockey. Players like Mark Fistric in the Dallas organization have joined AHL teams after the NHL playoff run is over to help bolster the AHL ranks and also to give useful playoff experience. On the other side, Stars killers from the Hogs have included Mark Cullen with 4-5-9, Kyle Greentree with 2-2-4, and Bracken Kearns with 2-2-4 as well. Also, flying below the radar, is the addition of Ben Smith to the Rockford IceHogs roster. Smith, signed to an ATO after finishing his collegiate career at NCAA national champion Boston College, was a sixth round draft pick of the Chicago Blackhawks in 2008. Smith played four years for Boston, scoring 57 goals and 65 assists, including the game winning goal in last week's 5-0 championship game over Wisconsin. This is a player to watch out for. In nets for the Stars, we know what we have and that's the Wrath of Krahn. Brent Krahn has faced the IceHogs in four games this season and has defeated them in each, allowing only 4 goals and tallying two shutouts, a 0.99 GAA and a .971 SV%. My guess is that Krahn is the guy. Coach Gulutzan is going with a "win and you're in" philosophy, so Matt Climie will likely not see much playing time unless Krahn slips up. Climie has played in three games against Rockford, going 2-1-0 with 3.29 GAA and .898 SV%. Corey Crawford is the man in the net for the Rockford IceHogs. Crawford played in four of the games against Texas this year, going 1-3-0 with a 2.75 GAA and .904 SV%. Joe Fallon took three of the remaining games, but he was traded to Peoria for tender Hannu Toivonen. Toivonen is 2-1-1 against Texas this season with all four games coming with Peoria. Remember, the Stars have called for a white out. First 5,000 get a free white T-shirt to encourage the white out. All for One! In short, yes. I am aware that there have been some audio issues. The problem stems from the hosting service I was previously using. I am going through the process of fixing the audio links and embedded audio in the site. I am not going to update the On The Ice reports older than this week's quite yet, as I may be moving to paid hosting for these files soon. You can still access the files by downloading them using the download link after the embedded player. Thanks for listening! The longest interview of the day was the loquacious head coach, Glen Gulutzan. There was a lot of good puck talk in the interview, including the information I published earlier that everyone is healthy except for Mathieu Beaudoin. Gully wouldn't reveal his starting tender for Friday, but you have to think it's Krahn. I think the best portion of the Q&A is Gully's breakdown of the way you win playoff games. He boils it down to three things: goaltending, special teams, and a little bit of "puck luck", that is, getting those random bounces to go your way. Jamie Benn was a hot ticket in the media day interviews. The glitz and glamour of the NHL came down to pay us a visit in Austin, and everyone wanted to talk to Benn. In the interview, you'll hear that he mentions he's been practicing on a line with Greg Rallo and Aaron Gagnon. I asked Benn on the way out afterwards, and he confirmed that he would be playing wing in Texas. Both Rallo and Gagnon are centers, but Gagnon will likely center this line as Rallo has played wing often through this year. Mathieu Tousignant, who was not on the Texas Stars Clear Day roster, has been assigned to the Idaho Steelheads of the ECHL for their Kelly Cup Playoff series beginning Friday against the Utah Grizzlies. Tousignant recently signed an entry-level contract with Dallas for a three year period. He is on the playoff roster for the Steelheads where he tallied 6 goals, 11 assists, and 52 PIMs in 20 games this season. In 45 games in Texas, Tousi had 4 goals and 3 assists with 62 PIMs. Grabbed just a few seconds, literally, of GM Scott White's time at Wednesday's media day. He had some great things to say about how Austin has taken to hockey and even commented on the Stars franchise situation. All media day audio was recorded while practice was going on, so there are pucks off the glass and such in the background of the interviews. Special thanks definitely to Stars PR man Josh Fisher for letting a blogger into the media day pool. A lot of bloggers have traditionally had trouble getting access in sports, but I feel that the Texas Stars are doing the right thing by not putting up 'traditional' restrictions on media access. Josh Fisher and Andrew Hutchinson joined "The Bottom Line" hosts for the "On The Ice" report today for what was likely the longest interview yet all season. Clocking in at over 10 minutes, Hutch looked forward to the playoffs and talked about the team in general. Great interview. According to Andrew's Dallas Stars Page, Jamie Benn leaves today to join the team in Austin and begin practices for the first round playoff matchup with Rockford. Benn, a rookie in the NHL this year, played in all 82 regular season games for the Stars. He recorded 22 goals and 19 assists for 41 points overall. Benn is traditionally a winger, but he played at center some in Dallas through the second half of the season. He shifted a lot with Mike Modano and Jere Lehtinen through the last month of the year. Questions still remain as to whether Benn will play at center in Texas or on the wing. The answer lies in what direction the Dallas club wants to take Benn's development. Texas is already overloaded at center with 5 on the Clear Day roster, including Greg Rallo who has played at wing for much of the season. Texas took it easy this week, much to the dismay of their fans, with their Calder Cup playoff seeding mostly locked in at the beginning of the week. Key players such as Warren Peters, Raymond Sawada, Dan Jancevski, and Garrett Stafford did not dress for various games this week and it showed on the ice. Now Texas prepares for the first round playoff matchup against the Rockford IceHogs (Chicago Blackhawks). This is a good matchup for the Stars, especially since they have home ice advantage. Below the fold, we'll take a look at games from this past week and look forward to the first ever Texas Stars playoff run. Michael Neal, Richard Bachman, and Kevin DeVergilio all were send back down to the Idaho Steelheads to compete in the ECHL Playoffs as it is expected that Texas will get back many of their top scorers who had been resting before the playoffs. The only players not expected to be ready is Scott McCulloch, who is out with an upper body injury. The Stars and Aeros skated to a scoreless first period. Landon Wilson took a slapshot to the skate in the period but returned to the ice quickly. The period ended with Matt Kassian hitting Cody Chupp up high and knocking him to the ice. Chupp tried to regain his feet and fell back down again. Gazdic took on Kassian to gain the five minute major. Chupp did not return to the game. Houston broke the scoreless tie at 9:08 of the first when the puck came off Tyler Ludwig's stick and eventually ended up behind Bachman off the stick of Hilbert. Houston Aeros blog Third Intermission notes that Hilbert was sitting on top of Bachman when the goal was scored. Texas allowed 24 shots in the second period and the Stars were very lucky to make it out of the period with only one goal against. Warren Peters scored his 20th of the year on the power play. Peters shot beat Khudobin over the shoulder. Garrett Stafford and Richard Bachman got the assists on the goal. Just 103 seconds later, Ray Sawada was the beneficiary of a Houston turnover and scored his 8th of the year glove-side high with assists from Hutchinson and Warren Peters. From that point forward, the game was Houston's, however. Nathan Smith redirected a shot from Justin Falk. for a 2-2 tie. Houston went up for good just 2 minutes later when Fraser's shot was redirected by Carson McMillan. It was the 42nd shot of the night. Houston finished it up with an empty net goal from Danny Irmen. Texas has a tendency to get outshot but tonight was ridiculous. Bachman had to face a team record 24 shots in the 2nd period and overall 43 shots in the game. I don't think that this is the Texas Stars team we will see next Friday against Rockford. Many of the "big" names were back in Austin resting up for the first round. Don't get worried. We'll get worried if this is the same team we see next week. Tonight, Texas closes out the regular season in Houston with an eye on next week. The Stars and Aeros have had a rather one sided relationship, with Texas going 8-2-0-1 in the season series. The Aeros have two games remaining on the schedule but have been eliminated from the playoffs since mid-March. A win against San Antonio on Thursday night brought them back to a ".500" record. A few of Houston's top guys will be in Minnesota tonight facing off against Dallas in what could be Mike Modano's last game. Max Noreau and Robbie Earl have both been called up, along with Wade Dubielewicz, who could get the start for the Wild. Texas will, once again, be resting a lot of guys. As I said might happen, Krahn didn't even dress for last night's game. Texas is preparing him for the playoffs which start next Friday against Rockford. I would not take the outcome of this game tonight or the game last night too seriously when considering Texas's chances in the playoffs. We had a lot of guys out on rest and our #1 goalie was not in net. For Houston, Anton Khudobin is back in town. He has a 13-18-4 record with 2.45 GAA and .904 SV% in his rookie season. Also back in the pipes for Houston is Barry Brust, who is 6-6-0 with a 2.46 GAA and .908 SV%. Finally, Darcy Kuemper, who got the win against Texas last time we played, is 2-1-0 with a 2.41 GAA and .886 SV% in just four games played. This just in from the strange news dept. Houston has better home penalty killing than the Stars at 87.7%. However, the Houston power play is the worst in the league at 11.5%. Texas is mid-pack on the road power play but is #5 in road penalty killing with a 85.1% mark. Special thanks to Houston Aeros blog The Third Intermission for being so darn awesome throughout the whole season. You should give them a read! The Texas Stars just announced the schedule for their first round matchup with the Rockford IceHogs. Here's the lineup. Game 1 - Fri., April 16 - Rockford at Texas, 7:30 p.m.
Game 2 - Sat., April 17 - Rockford at Texas, 7:00 p.m.
Game 3 - Wed., April 21 - Texas at Rockford, 7:05 p.m.
Game 4 – Fri., April 23 - Texas at Rockford, 7:05 p.m.
That right there was not the note to end it on. It was a stinker of a game, made worse by bad officiating from Ian Croft. Apparently, he's got a history elsewhere of making bad calls/no calls that I found. Texas didn't help matters much by reverting to their mid-season selves. Passes through the neutral zone ended up on IceHog sticks all night and an extended offensive attack was nowhere to be found. Now I know we're playing with a lot of guys out of the lineup and such, but the fans deserved better at the last game. Rockford got the scoring started early when Jack Skille scored on a rebound of a Danny Richmond shot from the point. He managed to beat Climie to the puck on the right side and put it home just 91 seconds in. The first period ended with Luke Gazdic in the locker room after a spirited battle with Bollig of the Hogs. Gaz got in his punches but also managed to get his shirt ripped. He came out in the second wearing the number two. All of the second period's goals were scored on the power play. Rockford went first. On a play where faceoff man Bracken Kearns should have been thrown out of the faceoff circle, Cullen scored on a screened Matt Climie stick-side high. Texas scored next with a pretty one. Travis Morin streaked down the left wing side and threw one towards the net that Warren Peters hit with his outstretched stick and deflected up into the top-right corner of the net and past Crawford. Finally, it was Rockford again with a goal by Greentree. Really, Climie beat himself. He stuck out the pad the deflect a puck to the corner and instead it jumped up on him and went roof. Texas came out in the third with a lot of fire and almost had a goal or two. Mathieu Tousignant went to high on a shot where he had Crawford on the ice dead to rights. And then there was the no goal. The light went off, the crowd saw the goal, but Ian Croft waived it off. Crawford stopped play a few seconds later, but there was no review that we could see. It looked like the puck went in along the ice five-hole and bounced right back out at the same velocity due to hitting the center post hard. There was no review. There were no replays. There was no clarification. As I've talked with some folks on Twitter, they indicate that they puck hit the sidepost and bounced out. I'm not sure about that given the angles we saw, but I would have liked to see it again. We probably won't though. That's how media coverage works in the AHL. Rockford scored twice more as the no-goal seemed to let the air out of the building and the team. During all three periods, it seemed like there were all sorts of things not called. Mathieu Tousignant bore the brunt of it. Tousi got punched in the face on a scrum in front of the net and also got sat on back in the offensive zone as the IceHogs took the puck 200 feet away. There were others, but those stuck out most. Tonight, I'm going to an AHL hockey game in Austin, Texas. I write a blog about hockey in Austin, Texas. I've started seeing people wearing Texas Stars paraphernalia out in the community in Austin, Texas. 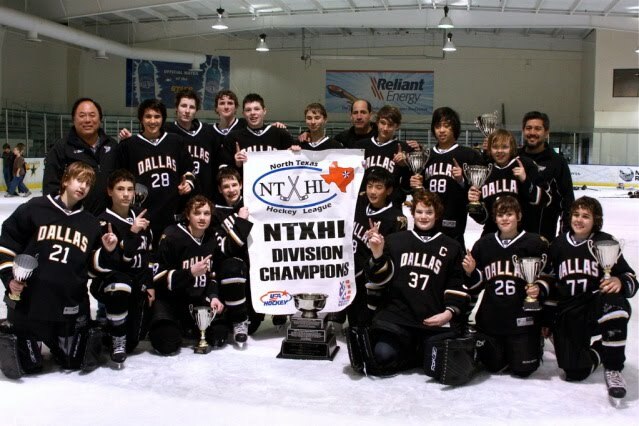 I play hockey in Austin, Texas. Here's my question. Would I be doing any of these things in Austin, Texas, without Mike Modano? The Stars all-everything player, franchise leader in every meaningful offensive category, emotional leader and ultimate franchise player, could have quite possibly played his last professional game in this state last night. I say pretty confidently that without him you wouldn't be reading this right now. There have always been "those people" out there who ask the questions of hockey in the South. Daryl "Razor" Reaugh alluded to them last night. They say, "Does hockey work in the South?". I want you to watch the following clip from last night's game and tell me that hockey isn't alive and well in Texas. Austin, Texas, has a ways to go yet before it's like Dallas, but have you ever been there? There are ice rinks all over the place and youth leagues abound. Recently, the very first Texas-born player was drafted in the 2007 NHL Entry Draft, by who else but the Dallas Stars. Austin Smith, a Coppell native, got into hockey due to a Stars' youth camp to introduce kids to hockey. I guess you could say that Smith, now at Colgate, is the most home-grown talent possible, a Dallas Star to the bone. None of this would be possible without the face of the franchise. We wouldn't have a team here in Austin without #9. The explosion of hockey in Dallas that has spilled over a bit to Austin now was thanks to him. And so I'm going to a hockey game tonight in Austin, Texas, and when Rob Mason announces that "Hockey's in the House" one last time this regular season, I'll know it's the house that Mo built. Thanks, #9. The Texas Stars and Rockford IceHogs tangle for the last time this season in what could end up being a playoff preview. It doesn't feel like we've previewed Rockford games a lot here and perhaps that is true. The IceHogs games this year were heavily front and back loaded on the schedule. The Stars and IceHogs played five times between November 13th and December 12th (before I started the blog) and then didn't face off again until March 5th. The Stars have only suffered one loss at the hands of the IceHogs, a 3-2 loss at Cedar Park Center on December 12th. Richard Bachman took the loss in the contest. Texas and Rockford last played at the MetroCentre in the first game of Texas's seven game road trip through mid-March. Since then, Texas is 7-2-0-0 and Rockford is 3-2-0-0. Rockford's season was a little heavy on games at the beginning of the season so they didn't have as far to go to make it to 80 before this Sunday. You'll surely remember the playoff picture talk earlier where Texas consistently trailed Rockford by a few points but had as many as four games in hand over the Hogs. The Hogs are led on offense by Mark Cullen with 50 points (19-31-50). Cullen has 6 points in five games against Texas. The IceHogs leading goal scorer is Kyle Greentree with 24 goals and 44 points total. Greentree only has 3 points against five games against Texas. In net for the IceHogs, Corey Crawford and Hannu Toivonen split time. Crawford is 23-16-2 in 44 games played with 2.71 GAA and .907 SV%. He has an 0-3 record against the Stars and has allowed 10 goals in the three games. Joe Fallon, who now tends net for the Rivermen, has started the most games for the IceHogs against Texas. Hannu Toivonen is 12-14-3 with 2.81 GAA and .904 SV% on the season. Specifically in Rockford, he has only seen action in five games, going 1-3-0 with 3.27 GAA and .892 SV%. Against Texas in Peoria, he was 2-1-1. Joe Palmer, from the Texas Brahmas of the CHL, was also just recalled to Rockford. He has never played in a game at the AHL level. Palmer played with Stars forward Mathieu Beaudoin at Ohio State University in the 2006-07 season. For Texas, their fate is mostly sealed. It is possible that Chicago could lose their last two and Texas could win their last two, but do we even want that? Of course we want Texas to win their last two games, but the ideal situation for Texas obviously involves the Stars playing the IceHogs in the first round. Texas's record against Milwaukee of 5-3-0-0 is nothing to sneeze at, but the record against Rockford is even better at 6-1. Additionally, Texas has never lost in Rockford. Tonight the Stars will probably not have as many of the top familiar players in the game. They will be getting well-deserved rest before the playoffs start. Aaron Gagnon will be back from Dallas. I'm thinking perhaps Matt Climie gets the start, but again, I don't like predicting such things. My logic there is of course that we want Krahn fresh for the playoffs. Texas already hinted that they are resting him as much as possible with the replacement of him with Bachman in the 2nd of Tuesday's game. Maybe Krahn doesn't even dress for tonight's game, since Bachman and Climie are both in town. We will see. Aaron Gagnon has been assigned back to the Texas Stars today after playing in one of the top 5 games I've ever seen as a Stars fan last night in Dallas. Gagnon played 8:32 of ice time, including 2:03 on the penalty kill. He won all 3 faceoffs he took and had 2 shots on goal and 4 hits in 14 shifts. I don't know too much about Aaron's hockey history, but I'm guessing last night was a memorable one for him. The Dallas Stars announced today that the club has assigned center Aaron Gagnon to the Texas Stars, Dallas’ primary minor league affiliate in the American Hockey League (AHL). Gagnon, 23, appeared in two games for Dallas this season, recording two shots. He was recalled on Wednesday and played in last night’s home finale for Dallas. Gagnon leads the Texas Stars in scoring with 58 points (27g, 31a) through 77 games. The 5-11, 186-pound center also ranks first on the club in plus/minus with a +19 rating. Last season he played for the Grand Rapids Griffins of the AHL, collecting eight goals and 11 assists in 61 games. The Quesnel, British Columbia native was signed by Dallas as a free agent February 2, 2007. Josh Fisher joined "The Bottom Line" hosts for the "On The Ice" report today for an abbreviated interview. In it, he predicts that we could be looking at next Thursday for the start of the Calder Cup Playoffs. It looks like Aaron Gagnon is getting rewarded for his hard work over the past few weeks with a callup to Dallas. Gagnon was the first ever callup to the NHL from the Texas Stars back in the fall and might be the last of the regular season as well. Gagnon had 19 of his 58 total points on the season since March 1. Congrats to him! Matt Climie will return to Texas today after last night's losing effort in Dallas. Even the other players admitted that they failed to support him in the game. It was a tough one for a one-game tryout. It has also been floated by Mark Stepneski of Andrew's Stars Page that Tyler Beskorowany will join the Texas Stars once immigration issues get sorted out on an ATO. Beskorowany, who was the Stars second round pick (#59 overall) in 2008, just finished his season in the OHL with the Kingston Frontenacs. He was 29-25-4 with a 3.52 GAA and .903 SV% in the regular season. The Frontenacs lost in the first round of the playoffs in seven games. If you've got one shot to make an impression to the new guys in Dallas, Matt Climie probably wished he could have this one back. I don't think it was his fault really though. Dallas's abysmal defense is nothing like the stout blue line group we have here in Texas, so Climie had less support than normal. "Definitely there were some ups and downs during the game. At times I felt good, confident. At other times I think I backed up in my net a little too much and wasn't really as aggressive as I usually play. Overall, I think it's just a good experience to get an NHL game in this year, and kind of use it and learn from it when I go back to Texas, and hopefully have a long playoff run." "They have some of the best young forwards in the National Hockey League. They have a number of good forwards who can shoot the puck, so I knew it was going to be a challenge coming in. I was prepared for that, and maybe I gave them a little too much respect. At the same time, I've got to hold my own, and give the team a chance to win." "I went out there, and obviously it's tough to give up the first goal on the first shot, and it's always tough to bounce back. I thought I did a good job of staying with it and staying positive and being aggressive and not really getting down on myself. I felt I recovered after that first goal and kept battling." Here are the game highlights from NHL.com, as well. Defending Big D notes that Nicklas Grossman was minus-4 in the game. Minus-4! It was his worst performance in that category ever. "Definitely, we probably could have given him a little more help throughout the game. It's a good team. I'm sure it was a good challenge for him. He was probably pretty excited about that. Like I said, that's a disappointing thing when you have a guy like him in net, and not everybody is on board. That's disappointing. We're professionals. We've got to come out with a lot better effort next game." Climie should be back in Texas for Friday's game against Rockford. The Stars closed up the record books on their neighbors to the south with a triumphant victory. The Rampage already had been eliminated from playoff contention coming into the game with Milwaukee's win over Peoria this afternoon. Texas finishes the series with San Antonio with a record of 8-4-0-0. San Antonio's record in the series was 4-6-2-0. One of the real stories of the night was the shots on goal count. Starting goaltender Brent Krahn saw 17 shots in the first period alone and stopped every single one of them. Sergei Korostin gave him some offensive support at the 4:30 mark on a nifty play by his linemates. Francis Wathier blindly passed the puck in front of the net to Travis Morin who passed it over the Korostin on the backdoor for the goal. It was his 13th of the year. Coming out of the first intermission, it was Richard Bachman, the callup from Idaho of the ECHL, between the pipes for Texas. Play-by-play man Josh Fisher indicated that it was likely not an injury issue. I am inclined to agree. I think Brent Krahn faced 17 shots in the first period alone and he's the guy you want to be fresh for the playoffs. Also, it serves the purpose of getting Bachman a look at the end of the season when things are decided much like the look Matt Climie is getting in Dallas tonight. Bachman allowed the first goal of the night 3:32 into the period when Jeff Hoggan snapped a nasty wristshot past him from the right-wing circle. Texas seemingly got caught too deep, and the Rampage had a 3-on-2. With San Antonio already out of the playoffs, you had to know we'd see some unpleasantries in the evening's game. Francis Lessard and Luke Gazdic battled in the first period, but the real nastiness came in the second. David Spina "interfered" with Perttu Lindgren in the form of a shot to the head. Lindgren lost his lid and immediately went down to the ice, bleeding all over the sheet. Initially Spina got two for interference but it was upgraded to a five minute major and a game misconduct. The league will also surely have a look at the hit. Lindgren did not return to the game after the hit. Texas could not score on the extended opportunity. There was also some nastiness at the end of the second when Trevor Ludwig had had it with Jeff Hoggan hanging out in his crease and it came to blows. Already on the penalty kill, Trevor said get out of my house in the form of a knuckle sandwich. It was a spirited bout. The Stars brought down the house in the 3rd though. Midway through the period, Matt Stephenson's point shot found Colton Sceviour in the crease but bounced away. It hit Shaun Heshka's skate and went right back into the net for a 2-1 lead. Three minutes later, Francis Wathier was the benefactor of a steal by Matt Stephenson and snapped a wrister past Tordjamn for his second point of the night and 19th goal of the season. Texas was outshot in the game 45-25 including 38-15 in the first two periods combined. The 45 shots in the game sets a new Stars record for shots against. Richard Bachman earned that third star tonight. I'm not sure if I would have made the same selections as the crew upstairs though. If you look at the boxscore, you'll notice something curious. Matt Stephenson had 2 points and was plus-3 on the night, being on the ice for every Texas goal. For Stephenson, who now has a grand total of five points on the year, all assists, and is minus-13 total, this was a freakin' huge game. I think my three stars would have been Wathier, Bachman, and Stephenson, in that order. On a side note, Texas was quite penalty prone this evening. They gave the Rampage seven opportunities and did not allow a power play goal on the night. Texas itself was 0/3 on the power play, including the five minute major. A lot of players got "injury" scratches tonight with Texas already guaranteed a playoff spot and home ice advantage. Texas only dressed six defensemen for the first time in a few weeks. Tyler and Trevor Ludwig played as a D pair tonight. They had been paired together in previous games at times. Landon Wilson returned to the lineup tonight and also accepted the award as team nominee for AHL Man of the Year in a pregame ceremony. The ultimate winner of the award was in net for the Rampage tonight, Josh Tordjman. Lots of things going on in that headline, eh? The Stars announced that Michael Neal has been recalled from the Idaho Steelheads. The Steelheads are not currently playing any games, as they earned a first round bye with their regular season play. Additionally, it looks like Mathieu Beaudoin is healthy again so Ned Lukacevic has been released from his tryout agreement. Here's the release. The Stars also announced that forward Michael Neal has been recalled from Idaho of the ECHL, while forward Ned Lukacevic has been released from a PTO. On Saturday, Texas added center Kevin DeVergiliio from Idaho. Neal, joins the Stars after playing in 57 games for Idaho, scoring five times and setting up ten others for 15 points. Neal was scoreless in four games this season with Texas. Texas recalled center Kevin DeVergilio on Saturday from the Idaho Steelheads of the ECHL. DeVergilio scored 18 goals and added 20 assists for 38 points in 48 games with the Steelheads this season. In all, he has played in nine games for Texas this year, recording one assist, 12 penalty minutes and a -2 rating. The 23-year old forward is in his rookie season after a four-year career at St. Lawrence University from 2005 to 2009. DeVergilio recorded 113 points in 143 NCAA games for the Saints. Forwards Ray Sawada, Greg Rallo, Warren Peters, Landon Wilson and Scott McCulloch each remain out with an injury. The Battle of I-35 finally ends tonight. After eleven games, the Stars hold the advantage over the Rampage 7-4 in the season series. With a loss tonight or a Milwaukee win, the Rampage will be officially eliminated from the playoffs. The two teams last squared off on Friday with Texas defeating San Antonio 4-3 in overtime on Francis Wathier's goal from Aaron Gagnon. In the meantime, Texas lost to Houston on Saturday 3-2, and San Antonio shutout Chicago 3-0 to keep their playoff hopes alive. By the time the puck is dropped tonight in Cedar Park, the Rampage's fate could already be sealed. An afternoon game between the Admirals and Rivermen could see Milwaukee clinch the final playoff spot and lock out the Rampage. The Rampage are a known quantity for the Stars and Stars fans alike. We know the big players to watch for, including Brett MacLean (30-33-63), Kyle Turris (22-37-59), and Alexandre Picard (26-23-49). Of course, the big bad enforcer type for the Rampage is Francis Lessard, a PIM-piling pugilist, who's racked up 284 PIMs on the season. He is #2 in the league in PIMs and has only played in 57 games. If he had played all 76 Rampage games to this point, he would be over 370 minutes and the far and away leader for the league, besting #1 Zack Fizgerald of the River Rats by over an hour. Whoa. Josh Tordjman is a likely starter in net. He is fresh off winning the AHL's Man of the Year award. He is 18-20-2 with a 2.97 GAA and .902 SV%. Among active Rampage goaltenders, he is the only one to have played against Texas. 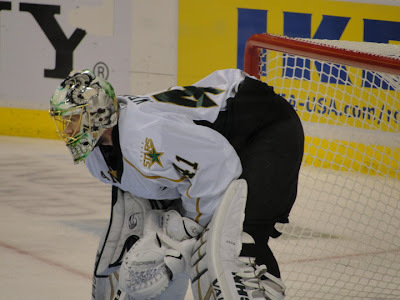 Al Montoya is still out with a lower body injury, and Justin Pogge was traded to the River Rats. Backup Miika Wiikman has only played in 5 games for the Rampage, mostly mop-up duty. He has a 2-5-1 record overall, including 7 games in Hartford, but only a 0-1-1 record in San Antonio. Overall, he has a 3.55 GAA and .887 SV%, but his numbers in limited action in San Antonio are considerably better with a 2.42 GAA and .919 SV%. For Texas, Aaron Gagnon is on fire again. Also, there are considerable injuries to take into account, which are listed below. I feel like a lot of these are the kind of injuries you would play through if you hadn't made the playoffs. However, since the Stars are mostly locked into the #2 seed, you can afford to give your top guys some time for wear and tear recovery. They've earned it. All of the players listed below will be back by the playoffs except Scott McCulloch. In net for Texas, we have Brent Krahn and Richard Bachman. Krhaner is 17-4-0 in 21 games played with a 1.86 GAA and .943 SV%. Sadly, he has only played 1226 minutes, so he does not appear on the AHL's list of top goaltenders (minimum is 1500). Bachman has been in Texas for 3 games since the call up of Matt Climie to Dallas. Bachman has yet to start a game in this stint in Austin but has accumulated a 3-3-0 record in several previous call-ups with a 2.07 GAA and .927 SV%. Is he ready for the AHL? Yea, I think so. This makes for some hard decisions for the Dallas management that we will discuss over the next few months. The transaction wire indicates that defenseman Maxime Fortunus has been sent back down to Texas. Fortunus did not play in any games while in Dallas. Texas is finally home and has to be feeling pretty good about their chances for playoff glory following an epic road trip that saw them win six of seven games, including the clinching of the team's first ever playoff berth. This week, Texas played three games, two at home and one on the road. The Stars have a shot, a very slim one, at being the #1 seed in their division at this point. It would require them to win out and have the #1 seed lose all their games. From a fan perspective, it's a much better place than having to win out to get in. In fact, the Stars just secured the #2 seed in the division, guaranteeing them home-ice advantage in the first round. So come on Dallas fans! Cheer on the future stars on the NHL and hop on the Texas Stars bandwagon. Inside, we'll talk about this week's games and go in depth on the playoff matchups that I expect for the first round. Also, we'll look at callups and the very full injury report. Texas had a lot of regulars out of the lineup on Saturday night. We know the pre-existing injuries. Wilson, Rallo, and McCulloch have been out for a while. Added to the listed were Sawada, Peters, and Beaudoin who are all out with lower body injuries. They are all expected to be back by the playoffs next week. It's always easier to write about a loss but it doesn't make it any more fun, sadly. Texas didn't really have it all together tonight and the Aeros got the better of them. Brent Krahn got the start in net for the second night in a row. The first period was quiet on the scoreboard but Texas had a lot of good pressure, especially in the middle of the frame. The team couldn't connect on any of the chances they were generated and looked overall out of synch. Houston opened the scoring in the 2nd period with a tip by Peter Zingoni on a shot for Max Noreau. Houston led the game 1-0 at that point and would not trail in the contest at any point. Just 62 seconds later, Andrew Hutchinson beat the rookie goaltender Darcy Kuemper five hole from the point on the power play. The puck honestly just slid in along the ground, and Kuemper didn't close his knees fast enough. Robbie Earl put in the first of his two goals on the night at 12:37 of the second. The goal was a garbage goal, picked up off the traffic in front and generated off a rebound. Still a tally on the scoreboard, no matter how ugly and Texas would go to the locker room down 2-1. Houston's Carson McMillan and Texas's Mathieu Tousignant got a chance to even the score finally after the sucker punch to the face that Tousignant took from McMillan earlier in the year. McMillan and Tousi dropped the gloves at the 14 minute mark but the bout was over in just a few seconds and I wouldn't say there was a winner either way. Texas and Houston traded tallies in the third. Houston took its turn first when Robbie Earl scored his second of the night, beating Krahn on a tip of Ryan Gunderson's point shot. Texas went next, with Travis Morin wristing a sick shot past Kuemper. Ned Lukacevic assisted on the goal, giving him his first point as a Star. And that's how it would end. The Stars couldn't pass to save their lives tonight. They had just hit a groove of winning 10 of their last 12 and really looking like a well-oiled machine, and then this. Are all of the players out of the lineup a factor? Tonight, the Stars did not have the services of McCulloch, Wilson, Rallo, Fortunus, Sawada, Peters, or Beaudoin. All are regular contributors to the Stars offensive potential. New or relatively new faces include Cody Chupp, Ned Lukacevic, Tyler Ludwig, and Kevin DeVergilio. Are we back to the mid-season Stars, where the team could not break out of their own zone? Well, this was a worrying game, but I think it was just that: one game. The Stars had a pretty big stinker to start their road trip, a 3-2 loss to Milwaukee where Krahn allowed 3 goals in the first and Texas couldn't stop shots from coming in. The team needs to synch up again and work as a team. It can't be helping that there are all of these players in and out of the lineup.